As suggested in yesterday’s market commentary for the euro vs dollar we indeed saw the predicted bounce higher which came as no great surprise given the turmoil currently enveloping Greece. The surge higher was largely a knee jerk reaction to the German suggestion that it would provide some sort of bail out package for Greece but in later trading confusion reigned as the ECB then suggested that in fact IMF intervention would be required – everyone conveniently forgetting the Maastrich treaty & throwing out the rule book! Whilst this period of uncertainty continues we will naturally see a degree of volatility across all markets and particularly in the euro vs dollar and should Greece be the first of several to default then the eurodollar could plunge further as a result. 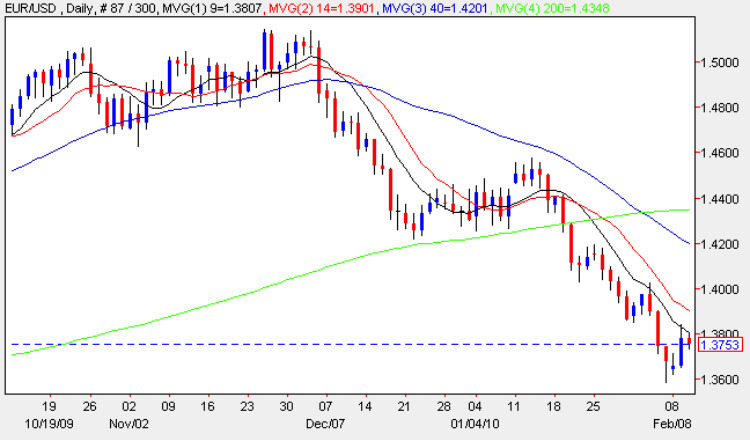 From a technical perspective and, as outlined in yesterday’s market commentary, the pair did indeed find resistance from the 9 day moving average, ending the currency trading session with a wide spread up candle but with a wick to the upper body. In early trading this morning this characteristic seems to have continued with prices being contained below the 9 day moving average. Against the backdrop of volatile fundamental news and the likliehood of further bad news from other member EU states coupled with the bearish technical picture any move higher should still be seen as an opportunity to sell euro for medium term gains with the 40 day moving average now dropping sharply below the 200 day this is all adding to the downwards pressure and the euro vs dollar remains the major currency most under attack. Today’s important fundamental news comes primarily from the US with the Trade Balance figures due out later today which are forecast at -35.8bn, falling slightly from last month’s -36.4bn. The only other change today is that the crude oil inventory data has been moved to Friday following the great snowstorm in Washington which closed the EIA offices for 2 days. In Europe earlier this morning we saw both the French and Italian Industrial production number which both came in negative following positive numbers the last time. Greek Debt Woes & Goldman Sachs (well they had to come in somewhere! !